Suiter was born in Winston Salem, NC and grew up in Hartsville, SC and Sparta, NJ. She graduated from Wofford College in 2012 with a Bachelor of Arts degree in English. She then attended The Medical University of South Carolina, where she graduated with honors and obtained her Masters of Science in Occupational Therapy. 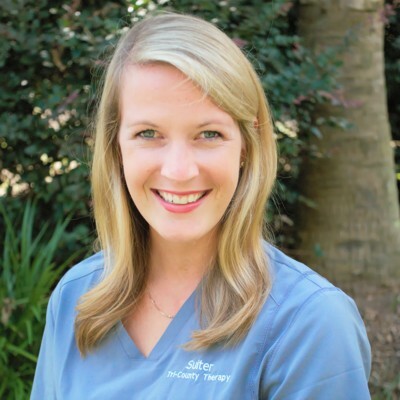 Suiter has worked with Tri-County Therapy since 2015 and provides Occupational Therapy in Mount Pleasant, SC. Suiter has had experience working in the outpatient pediatric setting at Duke Children’s Hospital in Durham, NC, and at Therapeutic Designs and Services, in Hartsville, SC. She has a special interest in working with children who have neurological conditions, sensory processing and feeding disorders, and developmental delay. She looks forward to collaborating with families to provide the best quality of care to help these children reach their fullest potential. Suiter completed Krisi Brackett’s CAN EAT course, which provides a medical, motor, behavioral approach to feeding disorders in children. In her spare time Suiter loves art and craft projects-especially photography, painting, and interior design. She enjoys traveling, writing, reading, and spending time with her family, friends, and dogs Buffett and Zeb.